TOWNSVILLE’S sixth bishop was sitting in his presbytery kitchen when he learnt his predecessor had been diagnosed with a terminal illness. Over the kitchen table at the Clear Island Waters church presbytery in 2012, Bishop Michael Putney told the parish priest and one of his former students in the seminary Fr Tim Harris that he was dying of cancer. “I was one of the first to hear that he had cancer, and that things were not good,” Fr Harris said. “He shared that information with me in my kitchen here at the presbytery. Pope Francis appointed Fr Harris, the Surfers Paradise parish priest, as Bishop of Townsville on Wednesday, February 8. The large rural diocese, which covers 434,400 square kilometres – larger than all of Italy – has been without a bishop for three years. Their fifth leader Bishop Putney died on March 28, 2014, from inoperable stomach cancer that had spread to his liver. “It’s a great honour and privilege to lead after Bishop Michael Putney,” Fr Harris said. “They are big shoes to fill. “Every successor says that, but in this case I really mean it – he’s a sacramental theologian, world renowned ecumenist. Where discussions on ecumenism were one of Bishop Putney’s primary contributions to the Church, it has been part of Bishop-elect Harris whole life. Born in Brisbane on October 29, 1962, Bishop-elect Harris is one of two children to a Catholic father and an Anglican mother. Attending Mass at St Flannan’s Church in Zillmere, the bishop-elect remembers the family’s Sunday church routine fondly. “Interestingly Dad would take Mum to the Anglican church, just down the road from St Flannan’s, drop her off and bring us, and my sister, back to St Flannan’s and then pick her up after,” Bishop-elect Harris said. “But Dad used to get a bit browned off because we’d be out in an hour and the Anglicans would go on for two, so we’d be waiting in the carpark for Mum to get out. “There’d be a moment of conflict because the Anglicans went too long. Throughout his priestly life, parents Shirley and Jim Harris have been the bishop-elect’s biggest supporters. In recent years, Fr Harris has been driving 100km from his home on the Gold Coast to care for his parents at Holy Spirit Home, Carseldine. Bishop-elect Harris was on his way to take his mum to the dentist when he received the call about his episcopal appointment. Roughly 20 minutes from the nursing home, he answered a call from the apostolic nuncio Archbishop Adolfo Tito Yllana. The nuncio advised Fr Harris to “pull over immediately”. “So here I am going down, with a car on my behind, and one in the front, and I was going down the hill and I had to get off fast,” Bishop-elect Harris said. “And he just told me then that the Pope had appointed me, and I just sat there listening. “It was the longest message delivered to me ever, and I just listened carefully, closed my eyes. After several minutes of deliberation with the nuncio, and wading through the guilt of leaving his parents on their own, Fr Harris gave his decision. “I said, ‘I accept, with the grace of God’, not knowing what is before me. But it was a sad moment when he told his parents, who are both showing early signs of memory loss and dementia. “They have heard and in their hearts they have understood,” Bishop-elect Harris said. The grace and mercy Bishop-elect Harris felt at that moment, and said he has felt during his entire priesthood, will now become his episcopal motto. He was unprepared for the influx of text messages, calls, emails of congratulations and media interviews. “So I said yes, and now, days later, I’ve accepted the consequences of that yes and the affirmation from people from Townsville, right around the diocese, family, friends, has not stopped,” Fr Harris said. One of his favourite messages is a photo of the Townsville diocesan staff eating a cake in celebration. “I presume they’re not just having cake for any reason – they have a bishop,” Fr Harris said. “That photo made me very happy, that they have taken the time to send a picture to me, they’re having a cake, it sounds like they’re celebrating, they have a smile on their face. “I hope I don’t let them down, (that) they’re smiling one week and crying the next. “I know they’ve been waiting for a bishop for three years. I don’t know why the long wait except I don’t think it’s from want of trying. “I think they were trying and the Pope and the cardinals and the committee of bishops who make these recommendations to the Pope were trying very hard to find someone. All the excitement from friends and strangers reminded Fr Harris of something his predecessor had once said to him. “(Bishop) Michael Putney said, as he was dying actually, ‘I didn’t realise how many people love me’,” he said. 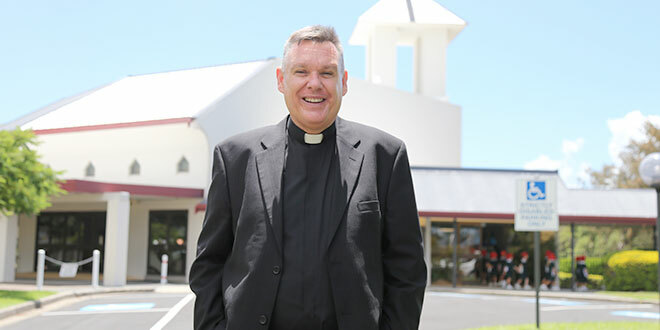 Bishop-elect Harris will celebrate his final Mass in the Surfers Paradise parish on February 26 and will be ordained a bishop in the coming months. When he arrives in Townsville, the bishop-elect will spend the first few months listening to the people of the diocese. “I’m going to have very open ears, and an open mind, and an open heart, and I’m going to listen to what the locals tell me and probably going to have to do that for some months, but I need that, from day one to surround myself with the best people possible,” Bishop-elect Harris said. As his appointment coincided with the final Catholic wrap-up of the Royal Commission in child sexual abuse, Fr Harris is also taking into consideration the commission’s recommendations for the Church. “I think there’s one thing that no one really wants to talk about at times, but I think you’ve got to be honest,” he said. “The Royal Commission that I’ve been listening to pretty intently, because of what’s happened to me in the last few days, what’s come out of there is that we’re going to have to be more and more transparent. “Also it seems the advice coming from that experience is that those dioceses that had a more inclusive leadership or had women in some of those decision-making opportunities, those diocese were less likely to have child sexual abuse. Bishop-elect Harris said he would also focus on best management of priests who were sent to “far-flung places” thousands of kilometres away, many of whom were overseas clergy thrust into “isolated” communities. “What I’m seeing is, from the limited number of clergy we’ve got, or available clergy, I don’t know how you keep the diocese Eucharistic in terms of the celebration of the Mass,” he said. “How do we assure that happens? “Because the implication is you’ve got to have someone going out to these far-flung places and because the locally grown clergy are declining in some ways, we’re relying on these overseas priests, we’re asking these priests to go out into places that are just almost so isolated. “I want to make sure that any priest that we send out there is okay. “They might have to talk to me on Skype. “How do we make sure of that without going into their lounge rooms, zeroing in on what they’re doing, watching television or how many drinks they’re having … how do I make sure those blokes out there are looked after and are okay? “There’s got to be a whole review. One thing is clear – Bishop-elect Harris is full of enthusiasm for his challenging journey ahead. “But for better or for worse the Pope, the Spirit, has chosen me so I’ve got to be able to rely on that help,” he said. “God helps those whom God has called.